A German-style Pils with pale gold color and good body, this crisp, clean and very bitter beer has pronounced hop aroma and is made with the famous Hallertau hops. Kaiser Pils is brewed with triple decoction mashing. A beer worthy of an Emporer. It pours a somewhat bland gold, the head is very nice however forming a round white globe around the rim of my pokal. There is a nice noble hop smell up front, it has a subtle fruitiness and a bakery like malt scent. The taste is well balanced. It has a noticeable hop character, very nicely done, along with a leveling maltiness. It still seems a bit more hop-forward but it is pretty balanced overall. There is some metallic flavor at the beginning but it fades after the second quaff. The mouthfeel was pretty spot on for the style, rich in body, but also with a persistent carbonation. This pilsener is one of the few american examples that isn't a butchery of the style. 12 oz bottle into hardywood tulip glass. A: very clear, very bright gold body. carbonation is streaming. head is bright white with good retention and fantastic lacing. very good looking brew. S: spicy and earthy. green tea. herbal. chalky. T: plenty of hallertau hop flavor on the body makes this very refreshing. maybe a little metallic towards the finish? tin-y even. the finish lingers with bitterness, but not heavy. M: plenty of carbonation on a light bodied brew. D: this and their st. nick's bock are my 2 favorites thus far in brews i have tried from Penn Brewing Co. these guys can definitely brew a good lager and i certainly recommend this brew. Just ok. Not much body to this one at all. Smell is a grassy malt. Taste is mild and bitter but malty. Not much hops. Dry and bitter. Odorless. Weak mouthfeel. Bland taste which is lacking the crispness of a pils. Poured into a pint glass. A light yellow color, just a film of head, lots of carbonation. A real hoppy smell and taste. Tasted orange zest up front with a hoppy profile, the carbonation leaving with a tingle on the tongue and a clean palette. A very hoppy Pilsner leaving a great tasting palette! Wouldn't be my favorite, but I would drink it again. Very clear, barely effervescent with no head. Taste was very salty, not very pleasant. dry. Overall would not have again. Pours a pale yellow color (Didn't want to say urine but it's accurate)with a smallish 1/4 inch white head that disappeared quickly. No visible lacing. Visit Penn's restaurant and brewpub whenever Iam in Pittsburgh,I have had three of there beers on tap and liked all of them.Poured a really nice golden color with beautiful pillowey head that stuck around for some time.Spicey hop aroma with malt background,good spritzy element to this beer.Spicey/zesty taste with a good hop smack,really goes down easy.One of the best pils I have had either from this county or from Europe. I had this beer on tap at the brewery. Its a bright yellow colored liquid with a respectable white head. Its completely clear with moderate carbonation. Theres a slight hop aroma, maybe a little less aromatic than I hoped. Still, the smell is nicely spicy and flowery. Taste seemed a little grainy, with a distant maltiness. The centerpiece of the beer is a bitter, crisp, peppery hoppiness. It finishes with a teriffic lingering bitterness. Very refreshing and clean. I could certainly have a number of these with a plate of German Potato Salads. Kaiser Pils is a beer that is occasionally offered at the Penn Brewery on draft over their 14 year history. This bottling is limited to about 150 cases. 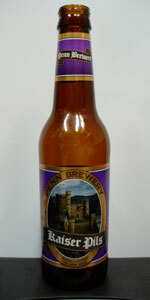 It's listed on their website as "The Brewmaster's Private Stock". This beer pours a brilliant golden color. The clarity is striking, as is the two finger, white, pillowy head that forms atop the beer. The head looks dense enough to float the bottle cap upon it. It displays excellent retention, as the head never fully subsides. As such it leaves a nice lacing on the glass. Steady carbonation trails can be seen from the bottom of my Munich pilsner glass. The aroma is a touch of malt with a big hop scent. Pepper and florals abound in the aroma. The taste is again very hoppy for a pilsner. The malt is barely detectable, but a strong, spicy hop flavor dominates. The finish has stong bittering which lingers through the aftertaste with a bit of a pine note and a hint of salt. The mouthfeel is crisp and clean and very refreshing. It also removes just about any other flavors that were in your mouth. This would be great with spicy food. The drinkability is excellent. I imagine this is what the German Pilsners taste like when they leave the brewery. This beer was released on January 31, tasted on February 3. Gotta love fresh beer! A great offering from Mr. Pastorius and the crew at Pennsylvania Brewing. Enjoyed this beer on tap at their brewery. Poured ultra clear and was golden yellow in color. Bright and glowing with a thin filmy head that left a small amount of lacing on the glass. Nice pleasant grainy malt aroma. The taste is light, yet sharp with an assertive floral-citric hop bite. Crisp and clean, light and tast with a light to medium body of malt. This beer has a pleasant bittersmoothness and overall very clean and enjoyable. A great American version of a classic style. Served up on tap at D's, was my beer I sipped on while hunting for new beers in the beer cave, and the second one was reviewed and then lastly after the review I found it to complement my Chicago style Vienna all beef hot dog. Appearance: Crystal clear golden nice frothing white head leaves nice uneven bands of lacing. Aroma: Slightly bready with some biscuit malt, and peppery Saaz very nice pils one of my favorite all around Penn brews just a great pils I would like to get a keg of this beauty for my house here in Morgantown I think it would go over well. Taste: What a crisp and flavorful pils I wish this one would replace the Penn Pilsner, great malty backbone a beer to be enjoyed especially if you like Saaz authentic German style pils, definitely a beer to be enjoyed when available. Mouthfeel: Medium bodied very smooth great carbonation. Drinkability: Incredible definitely one of my favorite microbrewed pils of all time, doesn't match up to Victory Prima but it's awesome. Thanks go to beergeek279 and cupbeerman for bringing a growler of this limited edition to Michigan for Trbeer and I to enjoy. Uses 2-row barley malt, Hallertau Perle and Spalter Select Hops, and triple-decoction mashing. Pours out to a clear pale golden, forming a small white head with no retention and lacing. Somewhat flat from the voyage with minimal carbonation, so keep that in mind for this review. Aroma is fresh with floral hops, a little touch of vanilla, pale malts, and a pleasant touch of grain husk. Aroma of crisp, mineralized brewing water is distinct. Taste is like the aroma with a nice Euro-pils floral hop note...the mild bitterness is accentuated by the mineral content. A touch sweet and a touch bitter...nicely balanced. The finish is very crisp and clean. Goes down nicely with a medium-light body. An excellent pils that has to be exceptional fresh from the tap. Would love to try their other stuff. Cheers!